It all starts with the song. 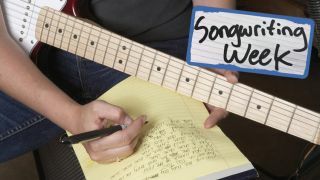 Songwriting is arguably the most crucial - and potentially the most lucrative - music-making discipline of them all, and MusicRadar is celebrating this fine art with a week's worth of features, interviews and tutorials devoted to the subject. We'll be chatting to artists who write songs for themselves and guns for hire who pen hits for others, asking them how they turn their moments of lyrical and melodic inspiration into fully-formed tunes. Look out, too, for tips and tutorials for budding songwriters, as we show you how to improve your skills. Finally, we've got the results of our search for the greatest songwriter of all time. We'll keep this page updated with new stuff as it's published, so check back here regularly throughout this week because you really don't wanna miss a thing (hmm… there might just be a song in there somewhere…).